This rich and silky smooth puree is anything but bland. The trick to this superior recipe is baking the sweet potatoes slowly in their skins before mashing. Sweet potatoes are firm, starchy tubers, which become sweet and gooey when cooked. This is because starch is a polysaccharide, which means that it is made up of lots of sugar molecules bound together in a chain. Heating breaks the bonds between the molecules, and so the starch is converted into sugar. The longer you cook sweet potato, the sweeter it becomes as more of the bonds are broken. 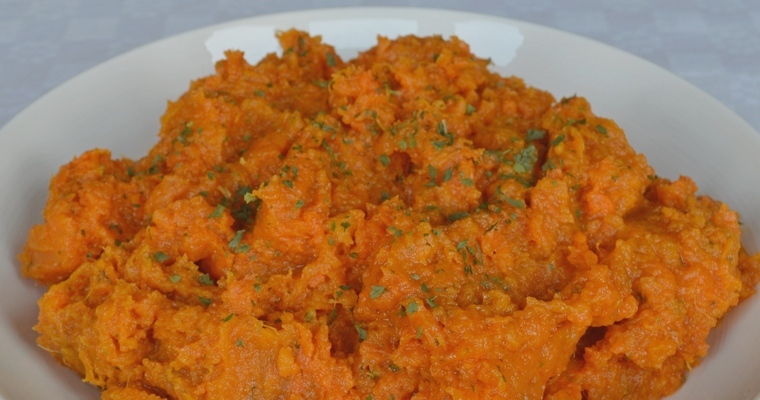 This means that sweet potatoes baked in their skins make the best mash, as they have much more flavour than steamed or boiled chunks. Depending on the size of the potato, this can take anywhere from 1 hour for smaller potatoes, to 1 hour 30 minutes for monsters. All you need to do is be patient and wait for the tell-tale sign of brown ooze in the baking tray, which signals that the natural sugars have been released. Put the sweet potatoes in an ovenproof dish and transfer to the preheated oven. Cook until the natural sugars ooze out and caramelise into a brown goo, and the skin becomes separated from the flesh – about 1 hour 15 minutes for a medium-sized sweet potato. Once cool enough to handle, peel off the skins with your hands and discard. Place the flesh in a bowl and mash to a smooth consistency using a potato masher. Add the remaining ingredients (olive oil, dried parsley and salt), and mix until blended.